Helios Type 69 Passive EQ, Software parametric EQ from Universal Audio in the UAD Plug-In series. 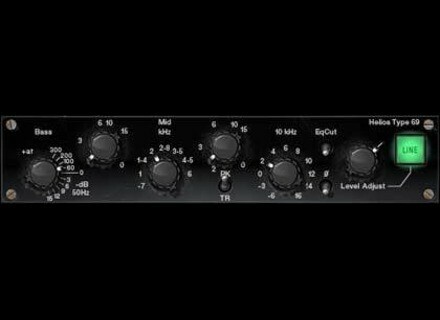 loudfunk's review"What a sweet EQ"
It's the usual Universal Audio procedure. Buy it on-line, download the authorization, record. I've run this on UAD1, UAD2 Duo, and UAD 2 solo laptop powered cards...on PC and Mac, and it works like a champ in any recording program I used it in. Whether it's Cubase/Nuendo, Samplitude/Sequoia, Pro Tools, Samplitude/Sequoia or Reaper. Helios consoles were used to record and mix some of the finest rock, pop and reggae classics ever produced. The Beatles, Led Zeppelin, The Rolling Stones, The Who, Roxy Music, Queen, Jimi Hendrix and Bob Marley are just a few that recorded with these amazing wrap-around consoles. Moreover, many great musicians of the era purchased Helios consoles for their personal use. Of all the Helios consoles produced between 1969 and 1979, the original “Type 69” is considered the most musical. Universal Audio modeled the EQ section of the very first Type 69. This console was originally found at Island’s Basing Street Studio in London; it now resides with Jason Carmer in Berkeley, California, where it continues to record multi-platinum albums. The simple yet powerful Helios Type 69 Passive EQ adds a unique sonic tex- ture to the music that passes through it. It can be pushed to its most extreme boost settings while retaining openness and clarity. The Type 69 Passive EQ replicates all the controls of the original hardware. The Treble band is a fixed 10 kHz shelf EQ, while the Bass band functions as a stepped 50 Hz shelf filter (-3,-6,-9,-12,-15 dB) or frequency selectable Peak EQ (60, 100, 200, 300 Hz). The Mid band operates as a frequency selectable Peak or Trough (Notch) EQ with eight frequencies (.7, 1, 1.4, 2, 2.8, 3.5, 4.5, 6 kHz). Other features include Level Adjust, EQ Cut (bypassing the EQ circuit while retain- ing the native sound of the unit), and Phase Reverse. The Helios Type 69 design works in such a way that (depending on the set- tings) entire EQ circuits are switched in and out. In the hardware that often meant audible popping Which is not the case here. This is a very nice sounding EQ plug! No pb runs as UAD-1, which is the very stability. As usual after purchase on the website of Audio U., it downloads a few kb file and double-clicking, which allows instant plug! Total time 5 minutes and it works! Others should really take a leaf! Manual: very complete, as usual again! This is the emulation of the game console EQ 69 Helios, which was used to Beatles and more! Less known than Neve or API, this brand is legendary nonetheless. you will see that u did not faint of heart: they even filmed a comparative harware / software on the slopes of a battery! Not many publishers who have the courage, mmm?